Once innocence was lost, though, I learned that Lorraine had some competition. I tried quiche with cheese and quiche without, quiche with spinach and quiche with goat cheese and onions. Some were tall and rustic, like the ones my mom adored, but others were baked in tart pans, their fluted edges giving this lunch delight a dose of sophistication. The best quiches were nutty and rich because they featured not any generic Swiss cheese, but earthy Gruyère. I probably had five slices of quiche when I went to France for a 10-day exchange in high school. Unlike my classmates, I could not subsist on pain au chocolat alone. But, the most memorable quiche I’ve had actually hails from Yountville, CA. The quiche Lorraine at Bouchon is the very best version of my mom’s ideal quiche. I’ve found that most places can get the filling right, as long as it’s not overcooked. The crust, though, is another story. The crust at Bouchon was flaky, dark golden brown, and a little bit crumbly and loaded with butter—it reminded me of the quiche shells in France. I recently had a hankering for quiche and knew I needed to fill it not with ham and gruyère, but with something from the farm stand. I’m usually the first one ready for fall. But this year, summer’s end is bringing a fair share of uneasiness. The end of summer means an end to the internship I have loved for a company that has taught me so much. I feel like I didn’t seize the summer, enjoying only one day at the beach and making only one pie. I didn’t eat as many peaches as I would have liked, and I didn’t go out for ice cream once. Call these simple childhood pleasures, but they’re ones I enjoy. 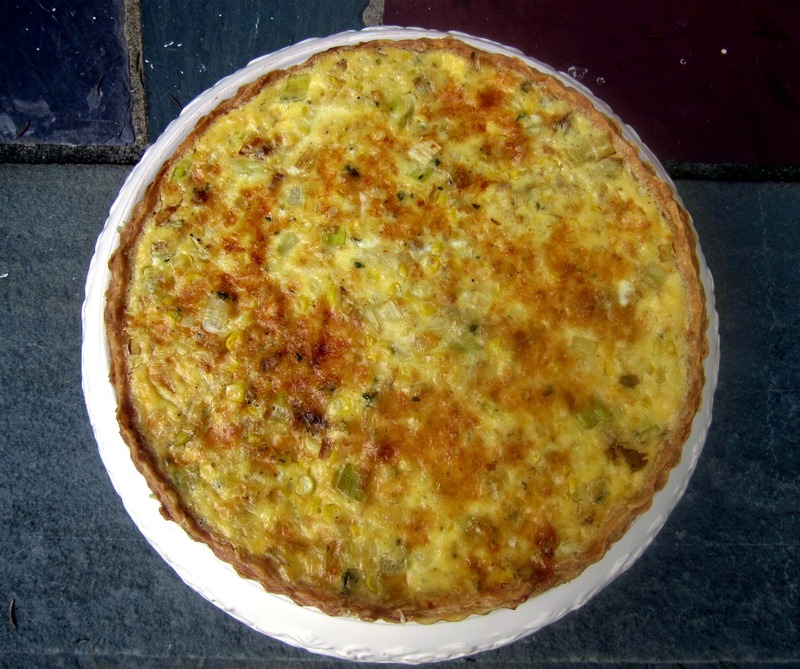 I knew I wanted to give summer and its produce a proper send-off, so I chose a unique leek and fresh corn quiche. 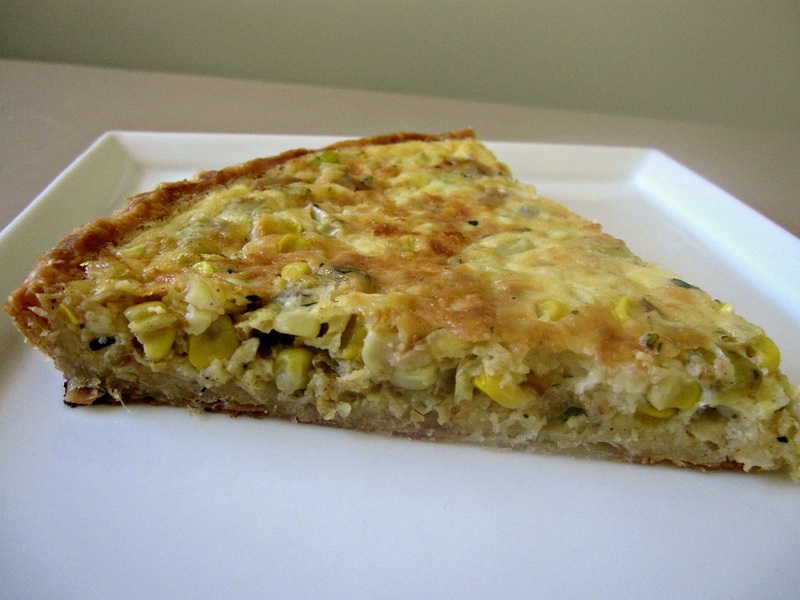 The filling is usually a breeze, so I take great care in making a quiche with a killer crust. This was the perfect way to satisfy my quiche craving. The filling was so fresh, thanks in part to the recipe and in part to my local farm stand. I cooked the veg on the stove in butter and olive oil until it was almost caramelized and seasoned it with some fragrant fresh thyme. Where there is heavy cream, there is nutmeg, and it rounded out the custard, adding to the nuttiness of the Gruyère. Excuse me, the Comté Grand Cru. Yes, a young monger at Formaggio Kitchen that my quiche needed the Gruyère of all Gruyères. I couldn’t resist. He pronounced everything so well… Unlike some quiches, the cheese hits you over the head. To some it might mask the subtle richness of the egg, but it does not at all overpower the beautiful produce. And the crust. This crust is what dreams are made of. I use it for everything. The recipe is a classic pâte brisée from Martha Stewart, and the method is my own. *Rant alert. * If anyone tells you that you need shortening to make a flaky crust, I give you permission to slap them. Some of my favorite cookbook authors sing the shortening gospel. I’d gladly smack them, too. My philosophy was always flavor over flakiness. With this recipe, though, I use butter and get a crust that’s so flaky, it’s almost like puff pastry. It has a light crispness and is layered in sheets that shatter to unearth its contents. You’ve heard it before, but the story reigns true: visible butter=visible flakes. Cold butter will not melt into the flour; it will stay in pieces. As you drag your rolling pin in a particular direction, these pieces of butter will create long smears. That’s a flake in the making! The water in the butter evaporates and the spaces create the flakes. I could continue this rant, but instead, I’m going to provide my method. The only downfall with this crust is that it shrinks a bit in tart form, but it’s worth it, dammit. I use a two-part method. I do believe in starting with the food processor, as it gets things done quickly, while keeping the dough cold. But I do not use it all the way, because I think it over processes the butter, which won’t allow it to create sheets later on. 1. Pulse flour, sugar, and salt in the food processor to combine. Add frozen cubes of butter and pulse until flour starts clumping together, but there are still larger chunks of butter remaining, about half the size or so of the original cubes (not course meal, like most recipes call for). 2. Transfer contents of the food processor to a large bowl. Using a pastry cutter (or two knives), cut the butter further into the flour, until mixture resembles a course meal with larger pieces remain. 3. Starting with 1/4 cup, drizzle ice water over the mixture and fold in with a rubber spatula, trying to get the dough to clump and hold together. It will not form a neat ball and still might look shaggy. If necessary (as it usually is for me, especially in the summer) add more water by the tablespoon as needed to get the dough to roughly hold together. Refrain from going over 1/2 cup. You might not think it will come together and that it will not roll out, but I promise it will! 4. Divide dough in half and place on two large sheets of plastic wrap. Working quickly to keep things cold and not too roughly, use the plastic wrap to gather dough into a flattened round. If things are getting warm as you do this, place the dough in the freezer for a few minutes and resume. If it gets messy, take your round and place it on another sheet of plastic wrap. Wrap tightly and refrigerate until firm for 1 hour or up to a day. The dough can also be wrapped well and placed in a freezer bag to be stored in the freezer for up to 3 months. Thaw in the refrigerator overnight before using. 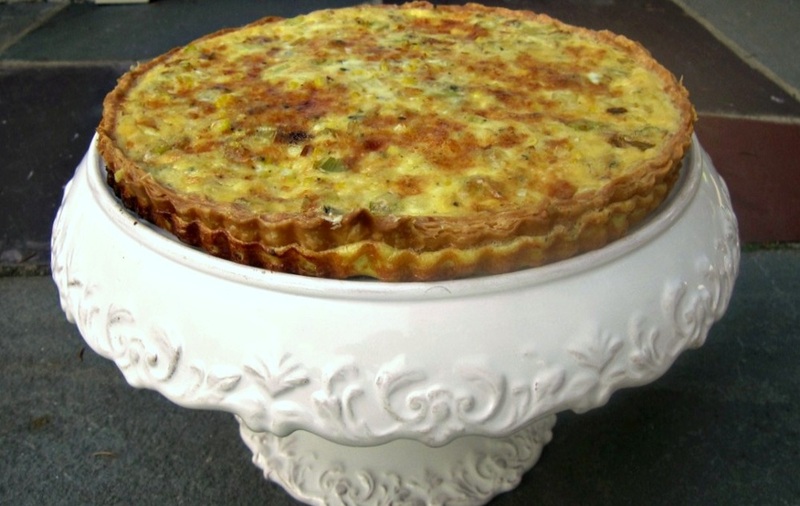 For this particular quiche, you’ll only need 1/2 the recipe for the pâte brisée. 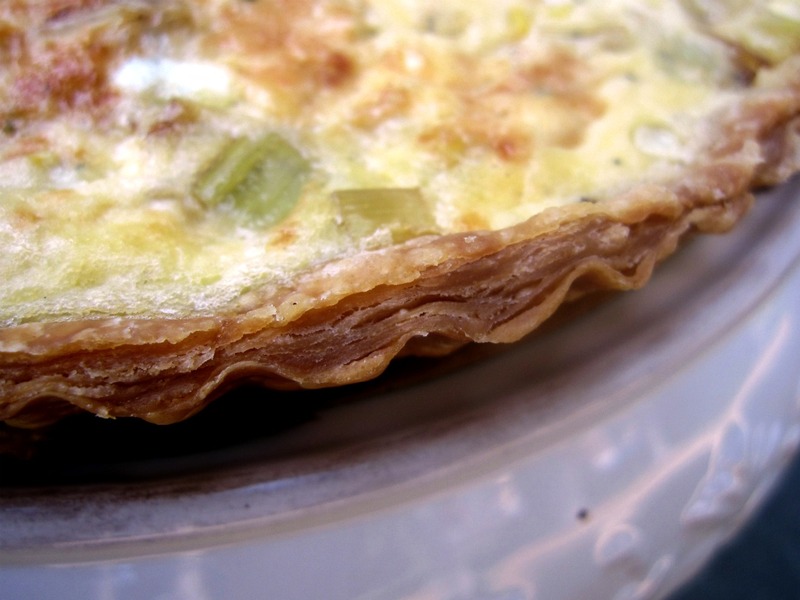 The quiche is baked in a 10-inch fluted pie tin but can also be done in 5 4-inch tartlet pans. 1. Place dough round on a large, very lightly floured piece of parchment paper. Very lightly flour a rolling pin. Roll out dough from the center to the edge, smearing the butter (which should still be visible), picking it up and turning it 1/8th of a turn to prevent sticking and to keep it as round as possible. Loosen it with a large offset spatula. Roll to an 1/8th of an inch thick and a 13-inch diameter (for this recipe). 3. Freeze for 30 minutes before baking. This will help the crust hold it’s shape when it hits the hot oven. The recipe comes from Martha Stewart’s Pies & Tarts, but since it is also available on her website, I am reprinting the recipe along with some modifications. Preheat oven to 375 degrees. Line shell with parchment and fill with pie weights, beans, or rice. Bake until crust is beginning to brown at edges, about 30 minutes. Remove parchment and weights; bake until bottom of crust is dry but not golden brown, 5 to 10 minutes more. Transfer to a wire rack to cool slightly. Meanwhile, make the filling. Heat oil and butter in a large nonstick skillet over high heat. Add leek and cook about 1 minute until translucent, stirring constantly to prevent browning (I like a wee bit of browning). Add corn and thyme and season to taste with salt and pepper. Cook, stirring frequently, until corn is fork tender, about 5 minutes. Transfer to a bowl and let cool slightly (and grab a small taste– it’s divine). Then prepare the custard: In a medium bowl, whisk together milk, cream, eggs, and egg yolk until combined, then whisk in nutmeg and season with salt and pepper. That looks great! And I like the corn-leek combination. I would sacrifice a little appearance for that kind of flakiness in a heartbeat. It’s still beautiful! Sorry to see your internship come to an end. That must have been a great experience. Glad I got to participate in your fun project!